Funny Google AdWords - Have a good weekend everybody. Thread: Funny Google AdWords - Have a good weekend everybody. KernelPanic  agrees : rofl pizza! 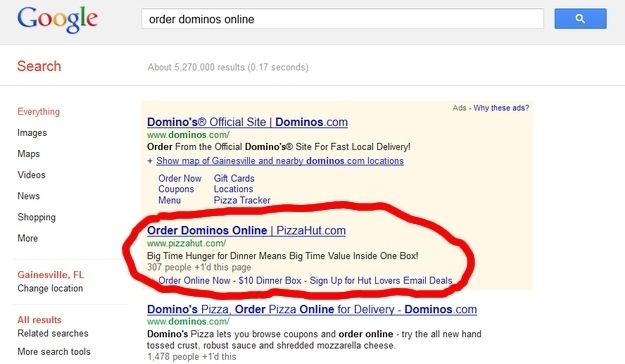 EGOL  agrees : Dominos should be mad about this! That's some good outside the box marketing...someone wants to order a pizza from Dominos and see that, they might change their mind and want a Pizza Hut pie. Ordering pizza Josh? Did you get Dominos or Pizza Hut? I guess it makes sense to buy PPC with your competitor's name! You're not allowed to use your competitors brand name in adwords. It's just something I looked into once. As I remember from what I read at the time you're allowed to use a brand name if you're selling their product, or if it's an informational page about them.. Please correct me if what I said is wrong. Edit> Hum, I've been reading about it again..
Last edited by DarrenHaye; Aug 10th, 2012 at 06:59 PM. Whether that ad is legal or not is one case, and whether Adwords will allow it is another. But if I were searching and would get the PizzaHut ad as a search result, I'd probably open a tab and have a look at what they have to offer. What Builds Trust with Google?